Hana residents encourage one another to engage in a more active lifestyle. Photo courtesy OHA. Heart disease and other health risks associated with a lack of physical activity and proper nutrition are the main targets of a project that just got underway Sept. 1 in Hāna, Maui. The Hāna Ulu Pono Project, is a health initiative funded by a $148,500 grant from the Office of Hawaiian Affairs. It is is just one of 22 outreach efforts across the state being funded through a larger $2.4 million grant program run by the Office of Hawaiian Affairs. The one-year effort in Hāna is focused on fighting heart disease and associated risk factors. 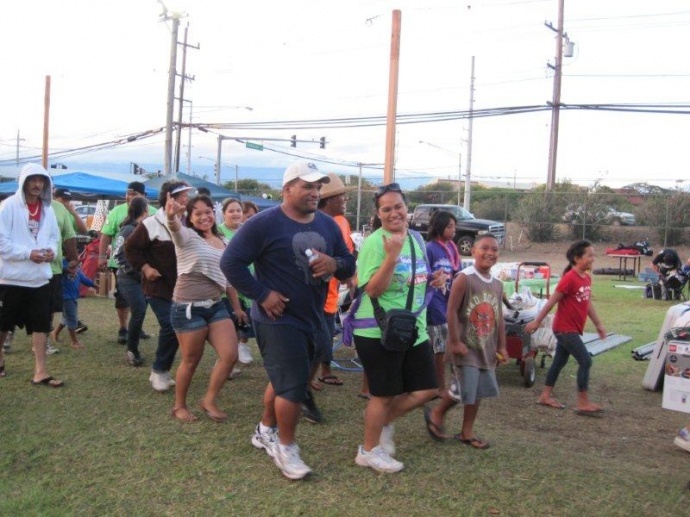 According to OHA, an estimated 150 native Hawaiians in East Maui are expected to benefit from the community-based project, which features traditional Hawaiian practices that encourage exercise and weight control. The program was initiated by a cardiologist from Queen’s Medical Center, and fits into a broader strategy at OHA to reduce the obesity rate among Hawaiians in the state. “Hāna Ulu Pono can diminish disease and restore health by using community-driven strategies that are anchored in native Hawaiian culture,” said Noreen Mokuau, dean of the Myron B. Thompson School of Social Work at the University of Hawaii in a press statement.